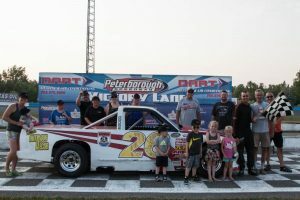 As an early-summer heatwave rolled through Central Ontario, the Saturday night racing stars at Peterborough Speedway pushed the temperature to the limit with a full night of action featuring the Battlefield Equipment Rental Bone Stock, Jiffy Lube Mini Stock, Trent Lakes Complete Plumbing Renegade Truck, Super Stock and Late Model divisions; along the with the Cottage Country Dash for Cash events, presented by Lucas Oil Products. Feature race action rolled to the Great Canadian RV green flag with a Battlefield Equipment Rental Bone Stock 20 lapper that had Jake Kelly and Rob Crick on the front row. 2-time defending track champion Jeremy Kelly was strong early, moving into 2nd spot and then the lead with only a handful of laps complete. The lead pack caught the tail-end of the field near the halfway mark, with Ryan Oosterholt taking over the top spot as the scoreboard clicked-off the 13th circuit. The driver of the #57 machine picked-up another checkered flag, with Jeremy Kelly, Chris Tubman, Jake Kelly and Shawn Solomon following the leader to the line. Bone Stock qualifiers went to Oosterholt, Solomon, Tubman, Corey Strawn and Sam Arnett with a pair. 2009 track champion Amanda Balson and former Oxford 250 winner Derek Lynch brought the Late Model pack from the staging area for their 30 lap feature. Balson had a strong piece early, with Chris Mitchell hot on her tail. The pair had started to put some of the backmarkers a lap down with 19 circuits complete, when the yellow flew for an incident on the front stretch a lap later. 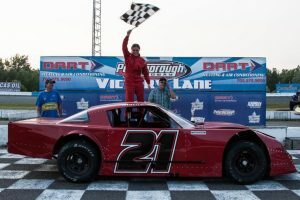 Lynch would wrestle the lead away from Balson following another caution on lap 23 and survived a green, white checkered finish for his first main event win of the year. James Horner grabbed the runner-up spot, with Dan McHattie, Mark Gordon and Steve Powell completing the top 5. Heat race wins went to Lynch, Mitchell, McHattie and Mike Wallace. Terri-Anne Whittern and Ryan Oosterholt were the front row starters for the 15 lap Trent Lakes Complete Plumbing Renegade Truck feature. Oosterholt took the lead on the drop of the green flag and never looked back. Not even a yellow flag on lap 12 would slow his charge. Bill O’Hara, Jeff Dolley, Whittern and Carrson Hennessy rounded-out the top 5. Hennessy and Oosterholt won Renegade Truck heats. 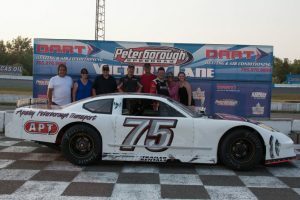 20 laps of Super Stock feature action had some girl power on the front row, as recent high school graduate Marlie Owen and Jessica Pasinetti led the way. Owen took the early lead, with Kyle Gordon on her back bumper as the pair encountered came up on the back of the pack with 6 laps in the books. 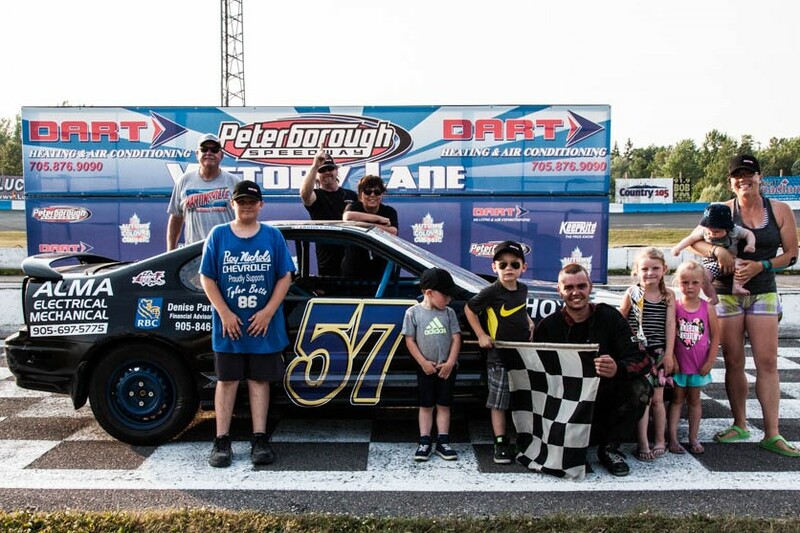 A yellow flag for a front stretch incident with 9 complete and another for a 2nd turn issue 3 laps later slowed the pace, but the young, second-generation racer from Port Hope, Ontario never wavered. Running smooth laps throughout the race distance earned the former go-karter her first stock car racing feature victory. Mark Gordon, Miles Tyson, Kyle Gordon and Pasinetti followed the #21 car to the checkered flag. Bailey Jacobs had a pair of Super Stock preliminary wins, with Howie Crowe and Pasinetti taking the others. 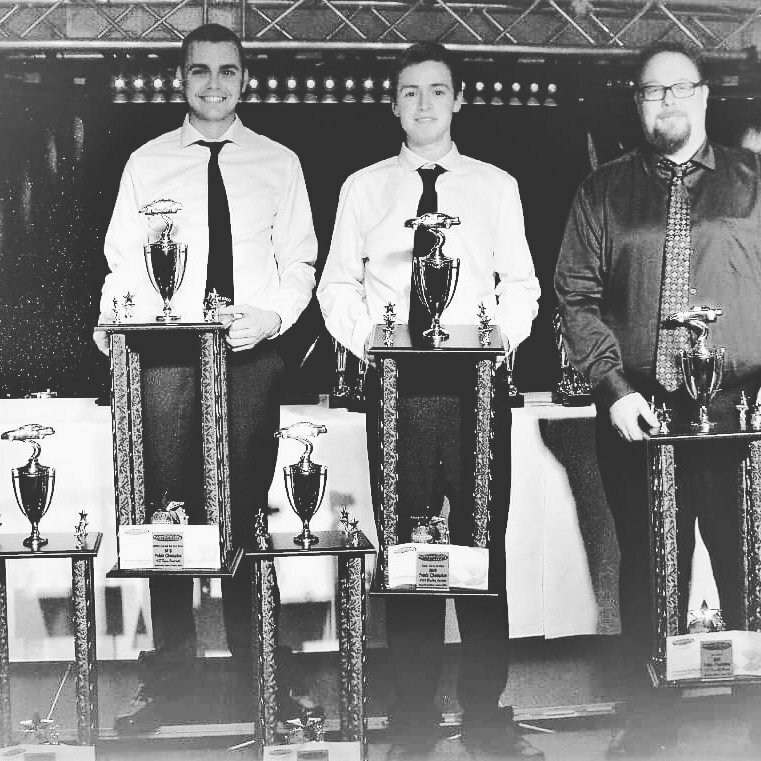 The Jiffy Lube Mini Stocks closed-out feature race action for the month of June, with Ryan Oosterholt and Kent Missons leading the field to the green. Oosterholt jumped-out to an early advantage, with Missons shadowing his every move. The leaders began working around backmarkers near the halfway mark, but this 20 lap main event would run caution-free. Oosterholt, Missons, Ember Junkin, Kevin Strutt and last week’s winner, Nolan Gould were the first 5 across the line. Oosterholt claimed a pair of Mini Stock heats, with Gould and Ember Junkin also finding their way to victory lane. All feature race finishes are unofficial and subject to scoring review, as well as post race technical and safety inspection. 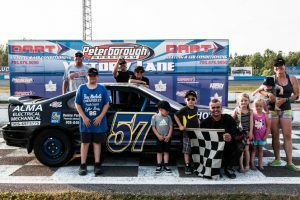 The Cottage Country Dash for Cash events – presented by Lucas Oil Products – gave home track racers a little extra cash for their performance in 10 lap shootouts. Chris Tubman pocketed $100 for winning the Bone Stock dash, with Alex McGibbon earning $50 in a random draw. Chris Mitchell took $450 for his Late Model win, with $225 going to James Horner. A $200 Renegade Truck dash payoff went to Ryan Oosterholt, with Jeff Dolley’s lucky number selected for a $100 bonus. The Super Stock $300 win went to Mark Gordon and Jonah Bell left town with an extra $150. Oosterholt also picked-up $150 for taking the Mini Stock shootout, with Kent Missons’ finishing spot drawn for a $75 payoff. Bullring bullet points: Peterborough Speedway management, officials and staff would like to thank the fans, drivers and race teams who braved Saturday night’s heat and humidity to back local racing…The night’s 50/50 draw – in support of the Millbrook Lions Club – paid $349.00 to Dale Bolton of Coe Hill, Ontario…Jeff Richard joined his friend Jonah Bell, who races in the Super Stock class and made the tow from North Bay, Ontario with his #99 machine for his first laps in the Peterborough Speedway Late Model division. 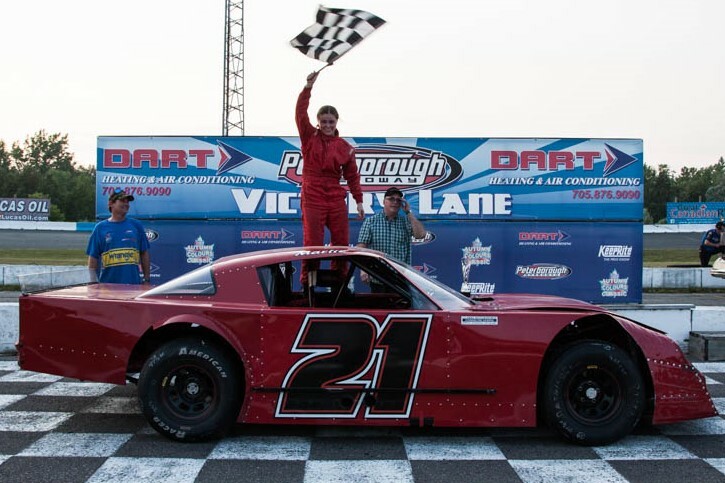 A flat tire in the feature race ended his night before the checkered flag…Miles Tyson made his first start of the year in the Super Stock field, while former track regular Alex Lees returned to action in the Mini Stock ranks. 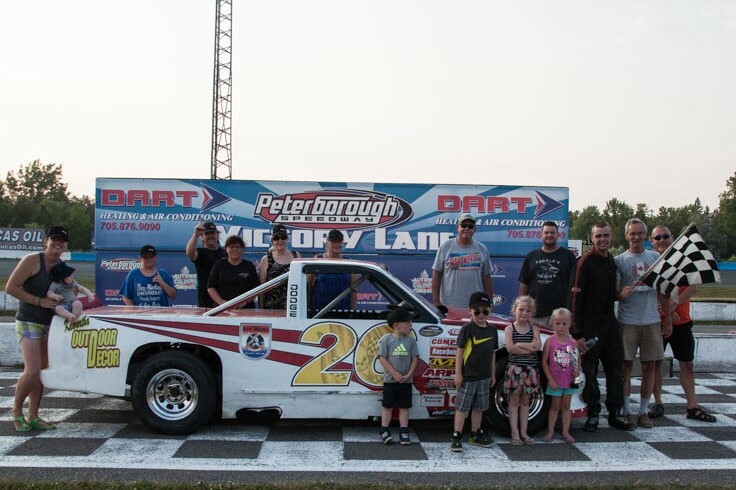 Action returns to Canada’s Toughest 3rd of a Mile Paved Oval with year’s 2nd Summer Toonie/Fan Appreciation Night – featuring $2.00 spectator grandstand admission – Saturday, July 7th. 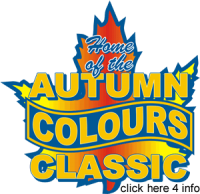 The highlight will be a 50 lap main event for the Super Stocks, with the hometown Battlefield Equipment Rental Bone Stock, Jiffy Lube Mini Stock and Late Model divisions; along with the Outlaw Midgets. Pit gates open at 1:30, with general admission grandstands unlocked at 4:00 and racing at 5:00. 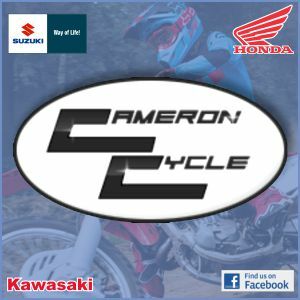 Visit www.peterboroughspeedway.com or check the track’s social media platforms including Facebook and Twitter for schedule updates.